A recent survey of A level students conducted by Which? found that around three in ten wish they had chosen different A level subjects. Only half felt sufficiently informed about how their A levels might affect their choice of university or choice of course, and three in ten said that advice they were given when choosing their A levels failed to take into account how their subject options might affect their degree and university choices. Careers advice in schools has long been criticised as patchy – not least by Ofsted, who in 2013 reported that only one in five schools were effective in ensuring that all students were receiving the level of information they needed. On the surface of it, then, it sounds like this may be a fairly straightforward failing on the part of school careers guidance practitioners. However, it would be wise for us to pause before pulling the trigger. I am fortunate to be part of the Bedales Professional Guidance Department which provides a well-resourced, highly-structured and regularly reviewed HE pathway for students. However, making good choices also requires an investment on the part of the student. To this end, we encourage them to make use of Unifrog – a wonderful resource that, amongst other things, is a comparison platform for university courses. It collates available data – subject requirements, typical grade offers, league table and student satisfaction scores, tuition and teaching provision, and much more. No less usefully, it allows students to calibrate their progress against what is available to them, and so make realistic choices. Overall, the resources we are able to bring to bear on behalf of our students bear no relation to those I encountered as a sixth former. Does this guarantee that our students make decisions that are right for them? Well, for those who are clear about their direction and highly motivated it is a great help, but for others the picture can be less straightforward. In my experience, around half of any 6.1 year group will know broadly what they want to do, with about 10%-20% of the cohort very clear about subjects and institutions, and how they plan to realise their goals. The remaining half will tend to be pretty vague in comparison – their direction might extend towards doing one of the humanities, but with little preference as to where. Around 10% of the cohort will have no clear idea. It is tempting to assume that students will make best use of what we make available to them. However, whilst at key points some want a great deal of my time, others need lots of encouragement to come and see me and give resources a wide berth. Unifrog would seem obviously useful when deciding upon A level and other choices, but a recent audit suggested that only one third of Bedales Block 5 students had visited the site. We must be wary, then, in assuming that students’ A level and university choices reflect the quality of careers and HE guidance available to them. And even when this is the case, things don’t always go to plan. For example, it is difficult to foresee that continuing a subject in which they had done well at GCSE may prove to be too much of a stretch for some, or that non-educational factors may change the picture for them. Working with such uncertainties is one of ways in which we careers guidance specialists must earn our corn. There are various approaches we can take to helping the undecided to ensure that they make sound choices at A level and university destinations. For example, we might steer them towards facilitating subjects – those that Russell Group universities have identified as having admissions currency across a range of courses. More specifically, for those who are less than firm in their preferences for university, we may encourage them to consider applying after they have received their A level results. This removes at least some of the uncertainty from the process for them, and we do it more and more. For those who are struggling to identify a specialism, we might make a point of highlighting the availability of liberal arts degrees which, initially at least, see students pursue a wider range of subject options thus allowing extra time to settle on their passion. Such programmes are well-established in the US, Canada and Europe, and an interesting new development has been the rising enthusiasm in UK universities for this approach. Sound advice from school careers staff is very important, of course, but I sometimes wonder whether we might be better advised to structure HE in a way that doesn’t require all young people to settle on specialism quite so early. Until such time, I would urge critics to pause before pointing the finger at schools – we careers and HE specialists do our best, but there are some things we simply can’t control. On 18 June, Old Bedalians who are now studying at university will join the school’s Professional Guidance staff and a careers expert to talk to 6.1 students about their options. A broad range of courses and institutions will be represented, and it should prove to be a highly informative event. What can we get out of doing exams? “What can we get out of doing exams?” I asked the students at assembly on Monday. This term is the most beautiful of the year at Bedales, yet it is a serious term, too, during which every student will sit exams of one sort or another by the end of term. We started addressing this question by looking at different motivations for doing something: extrinsic goals and intrinsic goals. Exams are generally thought to be good ONLY for extrinsic reasons: they are the ticket by which you access lots of other things you want, such as places at competitive universities, or jobs in industries where particular skills and qualifications are valued. There is a problem, though, in only going after extrinsic goals. Aristotle pointed this out in the Nicomachean Ethics, where he noted that if we only ever do something in order to achieve another goal, then we have no real reason for doing anything. To make this clearer, I used the example: if learning is for exams, and exams are to get you to university, and university is to get you to professional training, and the professional training is to get you to a job, what happens if, after all that, you don’t like the job you were aiming for? If we can find something intrinsically good about doing exams, all the better. I was arguing that exams are good because they allow students to become the authors of their own learning. We talked about different philosophical/psychological theories of knowledge acquisition, including Locke (which we rejected), Piaget and Vygotsky. It was Vygotsky’s vision we settled on – that when students receive the right support (scaffolding) with their learning from peers and adults, they can progress much better, such that they develop the structures of mind to begin to learn independently. It is this that the revision period gives to students: the opportunity to make learning their own, to move from needing the structures, to taking the content on as theirs. This is part of the conceptual furniture of their mind, not simply some knowledge fed in by a teacher and received passively by the student. I was arguing that the term ‘revision’ is misleading, because it suggests you are looking at something again; in fact, I think revision allows students to see the material for the first time through their own eyes, as opposed to through the eyes of their teacher. A student of mine in 6.1 proudly said to me the other day that she “owned Plato” now she had revised that material. Intentionally or not, she hit on something by saying this: in her process of independently working through the content, it has ceased to be my content, presented to her – her learning has become authentically her own. And this is something, I think, that we can say is intrinsically worthwhile, and in line with the school’s aim that we “cherish independent thought”. Bedales celebrated impressive exam results on GCSE results day with over a quarter of its students – 26 from a cohort of 102 – achieving a minimum of nine grades A*-A; 16 of them were educated at Bedales Prep, Dunhurst prior to progressing to Bedales senior school. 56.5% of the total grades awarded were at A*-A, and 94.1% at A*-C.
Unlike any other school, Bedales students tailor their studies by taking core subjects in the more challenging IGCSE qualification and the majority of other subjects in the school’s unique GCSE alternative, Bedales Assessed Courses (BACs). Only a small number of subjects use GCSE. All three qualifications use the same A*-G grading system. The content of BACs is broad and stimulating offering cross curricular opportunities that are suited to a wide variety of teaching and active learning styles. Internal assessment includes a mixture of written assignments, presentations, projects and performances, together with terminal examinations as appropriate. Results are moderated by external examiners. Bedales is the first school to be recognised by UCAS as offering its own GCSE-replacement qualification. Ten Bedales students achieved a minimum of nine A* grades, with three of those achieving 11A*s and three gaining 10A*s (see below). Six of the ten students were taught at Bedales Prep, Dunhurst, before progressing to Bedales senior school and sixth form. Josh Mazas from Liss achieved 11 A*s: Bedales Assessed Courses in Dance, Design, Drama, Geography and Philosophy, Religion and Ethics; IGCSEs in English, French, Mathematics, Double Award Science and Spanish; and 1 B in GCSE Chinese. Previously attended Bedales Prep, Dunhurst. Noah Clarke Hall from London achieved 11 A*s: Bedales Assessed Courses in Design, History and Philosophy, Religion and Ethics; IGCSEs in English, French, Mathematics, Chemistry, Physics, Biology and Spanish; and a GCSE in Latin. Previously attended Bedales Prep, Dunhurst. Zeyno Yurddas from London achieved 11 A*s: Bedales Assessed Courses in Art, English Literature, History, Philosophy, Religion and Ethics, and Outdoor Work; IGCSEs in English, French, Mathematics and Double Award Science; and a GCSE in Turkish. 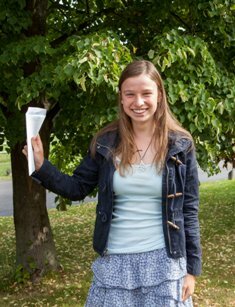 Anna Baring from Winchester achieved 10 A*s: Bedales Assessed Courses in English Literature and Philosophy, Religion and Ethics; IGCSEs in English, French, Mathematics, Chemistry, Physics, Biology and Spanish; and a GCSE in Latin. Previously attended Bedales Prep, Dunhurst. Phoebe Devonshire from Fareham achieved 10 A*s: Bedales Assessed Courses in English Literature and Philosophy, Religion and Ethics; IGCSEs in English, French, Mathematics, Chemistry, Physics, Biology and Spanish; and a GCSE in Latin. Michael Paterson from Midhurst achieved 10 A*s: Bedales Assessed Courses in Ancient Civilisations, Design and Geography; IGCSEs in English, French, Mathematics, Chemistry, Physics, Biology and Spanish. Previously attended Bedales Prep, Dunhurst. Godelieve de Bree from Hindhead achieved 9 A*s: Bedales Assessed Courses in Art, English Literature, History, Philosophy, Religion and Ethics, and Outdoor Work; IGCSEs in English, French, Biology and Physics; and 2 As in IGCSE Mathematics and Chemistry. Kit Mosely from Hambledon achieved 9 A*s: Bedales Assessed Courses in Ancient Civilisations, English Literature and History; IGSCEs in English, French, Mathematics and Double Award Science; and a GCSE in Music. Previously attended Bedales Prep, Dunhurst. 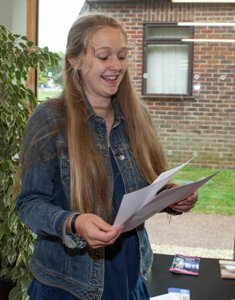 Julia Newlands from Steep achieved 9 A*s: Bedales Assessed Courses in Art, English Literature and History; IGCSEs in English, French, Mathematics, Chemistry, Physics and Biology. Previously attended Bedales Prep, Dunhurst. Cy Worthington from Richmond, North Yorkshire achieved 9 A*s: Bedales Assessed Courses in English Literature and History; IGCSEs in English, French, Mathematics, Chemistry, Physics and Biology; a GCSE in Latin; and an A in Bedales Assessed Course in Philosophy, Religion and Ethics. Molly Brooks from Chichester achieved 8 A*s and 2 As. *Ollo Catton from Petersfield achieved 8 A*s and 2 As. *Ben Allez from Petersfield achieved 7 A*s and 3 As. *Polly Caines from Petersfield achieved 7 A*s and 3 As. Harry Green from Liss achieved 7 A*s and 3 As. Megan Harley from Walton on Thames achieved 7 A*s and 3 As. 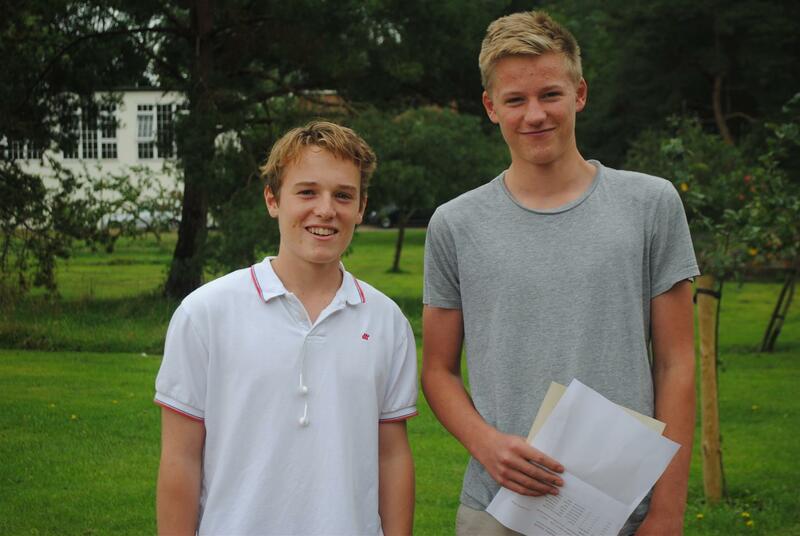 *Milo Howes from Ropley achieved 6 A*s and 4 As. *Kitty Kennedy from Petersfield achieved 6 A*s and 4 As. *Rose Voorhees from Petersfield achieved 6 A*s, 3 As and 1 B.
Stella Green from Hove achieved 6 A*s and 3 As. *Sam Harding from Steep achieved 6 A*s and 3 As. *Eloise Anderson from London achieved 5 A*s and 4 As. Elmo Meath Baker from London achieved 4 A*s and 6 As. Ottoline MacIlwaine from Alderney, Channel Islands achieved 3 A*s, 6 As and 1 B. *Quito Clothier from Petersfield achieved 3 A*s and 6 As. *Imi Gibbon from Froxfield achieved 2 A*s and 7 As. * Attended Bedales Prep, Dunhurst prior to Bedales senior school. Bedales’ unique curriculum is built around a group of five compulsory subjects: IGCSEs in English Language, Mathematics, Science (Double or Triple Award) and a Modern Foreign Language. This ensures both that the full range of core skills is covered and also that the minimum requirement for much of higher education is met. Students then choose from other options, which include up to five BACs from a total of 11 courses on offer that include subjects such as Ancient Civilisations, History (the 2015 cohort was the first to take the BAC rather than GCSE) and Classical Music, an additional IGCSE Modern Foreign Language or GCSE (eg. Latin). As Bedales students study a combination of three different qualifications, the figure quoted is a combined statistic for GCSE, IGCSE and Bedales Assessed Courses. No other school studies this unique combination of qualifications. Please note data is provisional. 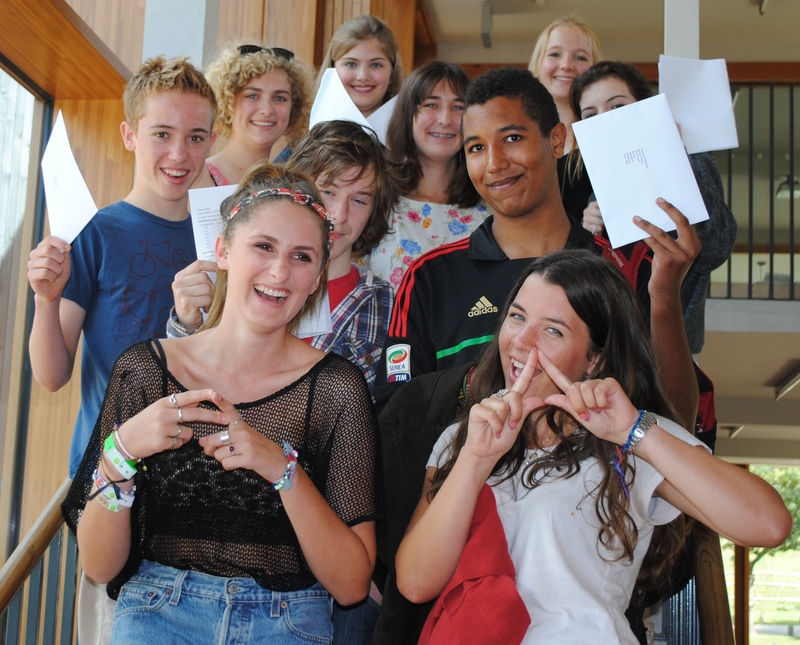 Bedales celebrated impressive exam results on GCSE results day with over half the grades awarded at A* or A. Unlike any other school, Bedales students tailor their studies by choosing a combination of GCSEs, the more challenging IGCSEs, and the school’s unique GCSE alternative, Bedales Assessed Courses (BACs). All three qualifications use the same A*-G grading system. Focussing solely on the GCSE and IGCSE element, this year’s cohort achieved 25% A* grades, higher than any of their predecessors since the current curriculum was started in 2008. Five Bedales students achieved a minimum of nine straight A* grades, with 17 others achieving a minimum of nine grade A*/As. Robin Allez (from Petersfield) achieved 11 A* grades in English, German, Latin, Greek, Maths, Biology, Chemistry, Physics, Theatre Arts (BAC), English Literature (BAC) and Philosophy, Religion and Ethics (BAC). Josh Grubb (from Petersfield) achieved 10 A* grades including three Bedales Assessed Courses in Design, Theatre Arts and Philosophy, Religion and Ethics. His GCSE subjects were English, German, Latin, Maths, Biology, Chemistry, and Physics. Georgica Deane (from Rowlands Castle) achieved 10 A* grades. In between academic studies this year, Georgica starred in a new video featuring an original song she wrote and performed with support from fellow students, and which Georgica debuted at the Bedales Rock Show 2012. Rufus Rock (from Petersfield) studied 11 subjects, achieving nine A* grades in English, French, Spanish, Maths, Biology, Chemistry, Physics, Art (BAC); and English Literature (BAC). He also received two A grades in History and Theatre Arts (BAC). Olivia Brett (from Rogate) achieved nine A*s and one grade A. Earlier in the year, Olivia was selected for a prestigious Sixth Form Leadership Award by national educational trust the Rank Foundation, which aims to ‘nurture leaders for the benefit of society’, in recognition of her outstanding leadership potential. Elliot Robson from Haslemere achieved eight A*s and three As. Claudia Anholt from Scratby, Norfolk, achieved eight A*s and two As. Angus Carey-Douglas from London achieved seven A*s and four As. Fionn Kennedy from Petersfield achieved seven A*s, three As and one B.
Natalya Minney from London achieved seven A*s, two As and one B.
Adam Osborne from Petersfield achieved seven A*s, two As and one B.
Jenna Sajous from the Isle of Wight achieved six A*s and four As. Zoe Kremer from London achieved six A*s and three As. Celeste MacIlwaine from Petersfield achieved five A*s and five As. Georgina Ullmann from Petersfield achieved five A*s, four As and one B.
Matilda Little from Hawkley achieved four A*s, five As and one B.
Imogen Welch from Steep achieved four A*s and five As. Rory Gower from Donnington, West Sussex achieved four A*s, six As and one B.
Frederick O’Donald from Rotherfield Greys, Oxfordshire, achieved three A*s and six As. Vincent Zulawski from France achieved two A*s and eight As. Lizzie Reynolds from Petersfield achieved two A*s and seven As. Cameron Macdonald from Buriton achieved two A*s and seven As. Bedales Assessed Courses are externally moderated and recognised by UCAS. Bedales’ unique curriculum is built around a group of five compulsory subjects: GCSEs in English, and a Modern Language, plus the international GCSE (IGCSE) Dual or Triple Award in Science and Mathematics. This ensures both that the full range of core skills is covered and also that the minimum requirement for much of higher education is met. Students then choose from other options, which include other GCSEs (e.g. History or a second language) and up to five BACs from a total of 10 courses on offer that include subjects such as Ancient Civilisations and Classical Music.